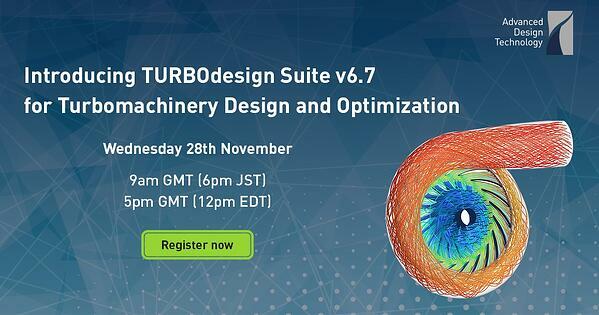 One of the world’s leading manufacturers of customized pumps asked Advanced Design Technology to design a complete Turbocharger system including both pump and turbine using the 3D inverse design approach available through the TURBOdesign Suite software. The customer set the requirements at both design and off-design conditions in terms of head and power, along with a minimum target efficiency for the complete system. It is well known that the main source of hydrodynamic loss in medium specific speed centrifugal pump impellers is the formation of secondary flows in the impeller, so ADT engineers started the impeller design with a spanwise loading distribution known to systematically suppress secondary flows. Such blade loading, represented in Figure 1, features an aft-loaded hub that increases surface velocities on suction surface of hub and a fore-loaded shroud that removes surface velocities on suction surface of shroud. 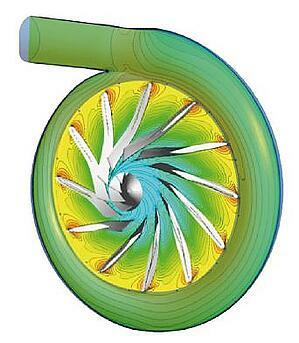 This span wise loading distribution results in a reduction of static pressure gradients on the suction surface. Hence, suppresses secondary flows results in high impeller efficiency and the more uniform exit flow ensures very good stage efficiency. 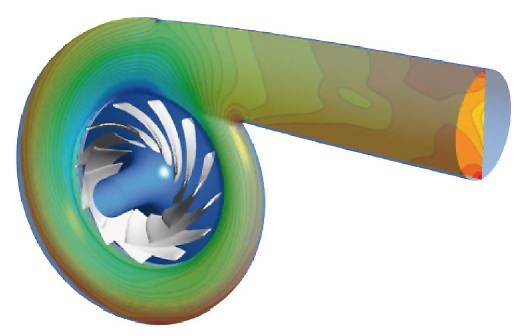 The turbine impeller was also designed in TURBOdesign1 following a similar process and principles as the pump impeller design, the aim being to achieve high total-to-static efficiency by reducing the accumulation of low momentum flows and exit swirl at the impeller trailing edge. To achieve this target the initial turbine impeller was designed with a fore-loaded hub and mid to aft-loaded shroud as presented in Figure 2. The final output is a clean 3D surface IGES file which is ready for meshing and 3D CFD analysis. The resulting pump and turbine stages can be seen in Figures 3 & 4. During the course of this project ADT engineers have used the proprietary tools TURBOdesign Pre, TURBOdesign1 and TURBOdesign Volute to design and optimise all the components of a hydraulic turbocharger plant system for reverse osmosis desalination. The unique features provided by ADT’s TURBOdesign Suite allowed ADT engineers to explore large areas of the design space within a very short product development timeframe and ensured the best performances could be achieved by the hydraulic turbocharger system. The full system was finally analysed with 3D CFD and the results confirmed all the Customer duty points requirements were met with a target efficiency exceeded by 5 points. You can download and the read the full consultancy summary in full: Hydrodynamic Design of a Turbocharger Pump and Turbine for Reverse Osmosis Desalination Plant Applications.